There are many aspects of crop and plant production that are critical for the success of the effort. One of the most often overlooked and seldom allow ed for aspects of production centers around the temperature of the root zone. After all, it is out of sight and there is not much that can be done about it. Besides, it must be OK to hold the entire plant at the same temperature, right? Wrong; and here is why. To begin, there are two main parts of a plant, the roots and the shoots, and one main intersection known as the crown. While composed of similar material, components, and engineering, the roles of the roots and shoots is, basically, opposite. The crown serves as the switching center that facilitates the change in function. The chemistry fundamentals are universal. While our focus here is in the root zone, the other two parts are affected as well. The basic purpose of a root is to take in water and those elements the plant needs to function that are available in the root zone. Other purposes include anchorage/ support and storage, which may be more important functions than uptake in some plants. Roots take in water and some nutrients through the basic process of osmosis where water moves across a membrane into the cells of the plant because of differences in their respective ion concentrations. Most elements other than water are most often actively pumped into the plant cells requiring energy. The part of the plant above the surface is called ‘shoot’ and is able to regulate its temperature through transpiration. The temperature range in the shoot can therefore be larger and it can change faster. The part of the plant below the surface is called root zone and is not able to regulate its temperature at all. The temperature range is therefore smaller and the roots need to stay cooler. The root has to guard itself against too much of some things coming in and against the loss of what is inside. To do so, it has evolved protections, barriers, and infrastructure that match the need. The root does not harvest the power of light being, in fact, a large consumer of those components and energy derived from the sun. In doing so it must respire, take in oxygen (O2), and use it to reduce the carbohydrates made in the photosynthesis process in other areas of the plant, to release the energy for use in its processes. It has no requirement for carbon dioxide (CO2). 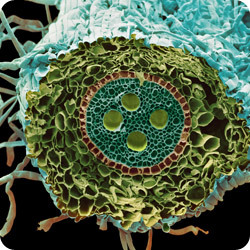 Roots or shoots, chemical reactions inside the cells of the plant tissue give off heat. They also require a certain level of temperature to start and continue; when these temperatures get too high, the reactions go haywire. Roots take in water and they do their best not to give it up and as such do not transpire to cool the tissue but instead transfer the excess heat generated in these reactions (latent heat) to the surrounding medium. Dense mediums such as soil, sand, even water, have a large temperature buffer that make the 24 hour swing in temperatures a root will see very minimal under natural conditions. The basic purpose of the top is to produce energy from the sun and fruiting structures to pass on its genes. In the process, it provides energy products and complex building blocks known as carbohydrates to the root system so that it can continue to function and develop to match the demands of the top. The tissues are designed to allow water and elements to move as quickly as possible through the tissue of the plant to each and every cell of the plant. Complex systems, (transpiration) simple in the basic idea and wonderfully complex in design, evolved to move raw materials and finished products, provide a ridged support to the structure of the tissue, and facilitate the collection of solar energy and the conversion of simple elements into complex organic molecules. Chemical reactions required for cell metabolism and function are the same top or bottom. When the lights go on, the air temperature rises and as a result the soil temperature will rise too. It takes a while before the soil warms up (just as it will cool down slowly after the lights are turned off). But it’s not only the air that influences the soils temperature. The material, depth (volume) and moisture level also changes its ability to give off or retain heat. Other reactions specific to the conversion of light energy to chemical energy also occur and a portion of the cells in the shoot of the plant are like chemical factories that produce more when reactions run faster. The temperature issues remain the same as in the roots; these chemical reactions will go haywire as temperature increases or slows as it decreases. When coupled with the extra incoming heat from the light energy, it becomes critical that the tissue has a system that can control this heat while transferring this to the air, a medium that is much more subject to bigger changes than a denser medium such as soil. These top tissues use oxygen as well at more or less constant values night or day, and they take in carbon dioxide during the light period to convert to the basic blocks of life, carbohydrates. All this the top must do in a temperature range that is subject to much greater fluctuation in a 24 hour period, sometimes 10 degrees or more Celsius that will occur rapidly. transports carbohydrates and plant hormones. The crown of a plant is the junction of the root tissue and the shoot tissue. In some plants, these crowns are clearly defined and ridged in location, and in others they are not so clear and sometimes variable. This location is like a massive telephone switching station that must take the incoming osmotically generated pressurized water/nutrient flow from the root, and feed it into a vacuum system that is pulling the flow up and out by the transpiration sinks (areas of negative pressure) generated in the leaf tissues, effectively changing the physics of the flow. The chemical reactions are busy, the temperatures vary, there is a change in the systems involved for temperature control, and oxygen is used in very high levels. A crown exists at the interface of the medium and the air, and to go too far into one or the other (planting too high or too deep) causes problems. Now, the temperature in the shoot zone, or top zone, has to be right for the reactions to occur. The top itself can slow transpiration or increase it as needed to maintain a temperature in the production tissues. As the lights go on, temps are low and so is the need for cooling. As the day wears on, energy increases and temperature in the air and tissues as well, so does transpiration, which then reverses as the day comes to an end. These temperatures, for example, can start at around 65oF and end up at 85oF before falling back, a 20 degree difference over half a day. 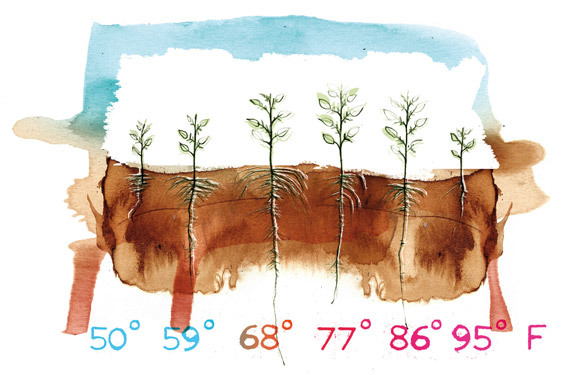 In the root zone, these temps may vary from 65oF to 66oF, a 1 degree difference, but the roots must be functional enough in their constant range of conditions to provide everything the top needs, and then does not need, as it goes through a rapid daily change. Plants took millions of years to evolve to the conditions in which they had to survive and propagate under unmanipulated conditions in nature. Soil temperature and characteristics change with latitude and composition. Plants evolved in specific locations to handle the needs they faced in their drive to procreate. Soil, natural or artificial, changes its ability to give up or retain heat based on material, depth (volume) and moisture level. Very porous material fluctuates rapidly, the same as dry material. 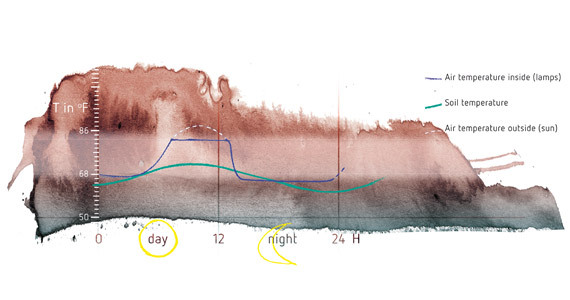 Fluctuation decreases as the material becomes denser or contains more moisture, and this is increasingly the case the deeper in the soil profile it goes. Still, the medium is slower to fluctuate, under all these conditions, than the air. If this medium is confined to a bucket, raised bed, or other container, then these fluctuations become more rapid and intense and develop a temperature profile more like air. This medium loses its ability to serve as a temperature control for the root under these conditions resulting in an under-performing root system with a large demand from the top unfulfilled. 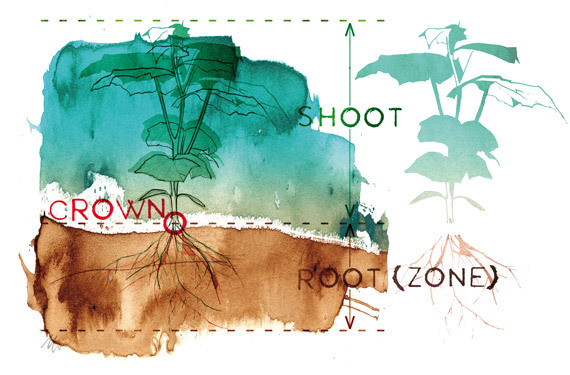 Shallow rooted plants work with bigger temperature changes closer to average day/night air temperatures, whereas deeper rooted plants deal with smaller fluctuations and cooler temperatures than this average. The plant root does not regulate its own temperature, and once temperature in the medium goes outside the perfect zone for reactions to occur, can no longer supply the rest of the plant with ideal levels of materials. This is true high or low. The greater the fluctuation in temperatures in a 24 hour period, the more stressed the root system becomes. The more stressed a root system is the more problems a plant will have both physically and pathologically, and will become increasingly susceptible to pathogens and insects. The placing of any root system in a medium above ground increases the surface area from which heat can be gained or lost. Plants will shut down (go dormant) when the root system stops most of its function, whether this is a result of cool conditions or hot conditions. This is true in container plant nurseries located in warm, sunny areas. In the summer, the containers heat up from the air and the plants go into a second dormancy even though they are watered and fed to produce maximum production and growth. Even the temperature of the irrigation water or nutrient solution will increase or decrease root function, and a sudden large temperature change will shock the roots. 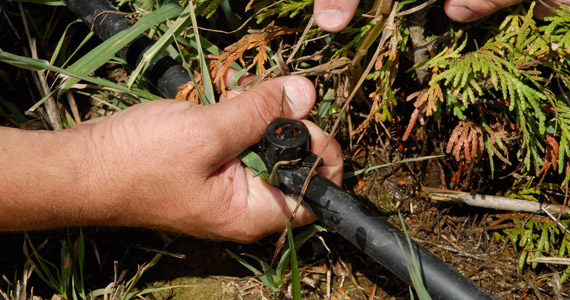 Good growers will warm or chill the water to be in the correct range before irrigating. Maximum function in a plant is very dependent on temperature and it is a much more complicated story than laid out here. The root and shoot systems have different sets of needs when it comes to temperature: one can function in a bigger range with warmer and faster changes, and the other in a much smaller, cooler, and stable range. Proper plant production has to take this into account. A slower root system will slow top development for any reason including the ability to properly perform the chemical reactions required by slowing the uptake of nutrients. Not just all nutrients but some faster than others which can show as individual deficiencies. Root development and function is best when kept in a range specific to the plant and a good grower will monitor and change these as closely as the grower will monitor and control the air temperature. Everything in a plant is interrelated; even a nutrient issue can develop in a properly fed plant where root zone temperatures are outside of the range. In the end, there are two different and entirely separate environments a plant lives in, and a good grower will pay close attention to both.